JGarden Description: The Mayne Island Japanese Garden continues to evolve. It was dedicated May 29, 2002 by the Lieutenant Governor of British Columbia. The site includes a large pond and has many trees and plants, including flowering cherries and plums, gingko and willows and much more. The bridge to the island has just been finished as well as a stone retaining wall and a waterfall. 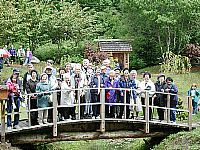 The group of volunteers that has built the garden recently completed a small meditation pavilion, a zig zag bridge, a waterfall, other bridges, a small pagoda and benches grace the site. Intended as a memorial to the Japanese who settled and developed the island, the garden is being constructed with the labor local of residents. Work parties are every Tuesday and Saturday morning. All are welcome to join in. The garden is located in a corner of the Dinner Bay Park.